Update, December 6: Here’s your first look at the Forntite Season 7 map. Fortnite Season 7 is nearly upon us, and, as ever, the battle royale’s map has undergone some significant changes. While Season 6’s terrain tweaks were relatively minor, Season 7 looks to have plenty to offer, largely thanks to the new Iceberg biome. Servers are currently down, so we don’t know much about the new area just yet. What we do have, however, is a potential leak of the new map (we’ll update with more reliable information when the servers come back up), which comes from Instagram user JH9. 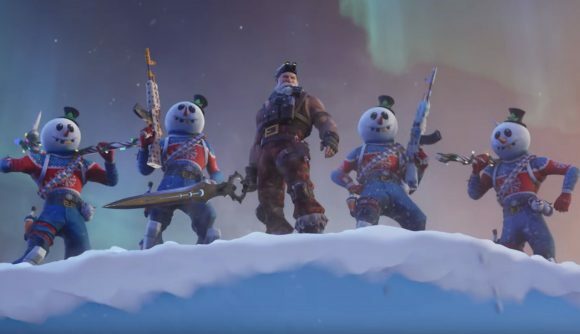 We’ll find out how accurate this information is when the servers come back up later today, but for know it’s looking pretty reliable – the new named locations – Frosty Flights, Polar Peak, and Happy Hamlet – are all here, and the new biome does appear to have spread from the south-west corner of the map. That’s the same direction the iceberg was originally spotted from. As well as filling in that particular area of the island’s coastline, the new weather conditions have caused widespread snowfall. From that southern corner, icy conditions have spread across nearly a third of the map, engulfing Snobby Shores, Shifty Shafts, and parts of both Tilted Towers and Lucky Landing in a blanket of white. To make room for those three new locations, some older ones have been rotated out. Greasy Grove is gone, replaced by what looks like a frozen lake, and Flush Factory seems to have made way for Happy Hamlet. The rest of the map seems to be unaffected by the changes. The Fortnite Season 7 Battle Pass has also been detailed today, showing off new weapon and vehicle wraps, as well as a bunch of new skins. The first version of Fortnite Creative is due to arrive with today’s update, giving Battle Pass owners their own private island to play on.